Within both feminist theory and popular culture, establishing similarities between embodied practices rooted in different cultural and geo-political contexts (e.g. ‘African’ female genital cutting and ‘Western’ cosmetic surgery) has become increasingly common as a means of countering cultural essentialism, ethnocentrism and racism. 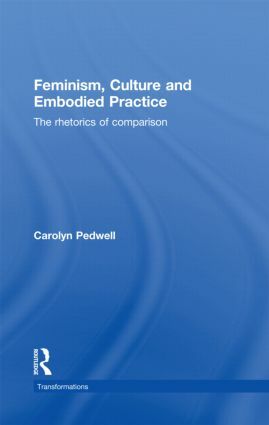 Feminism, Culture and Embodied Practice examines how cross cultural comparisons of embodied practices function as a rhetorical device – with particular theoretical, social and political effects - in a range of contemporary feminist texts. It asks: Why and how are cross-cultural links among these practices drawn by feminist theorists and commentators, and what do these analogies do? What knowledges, hierarchies and figurations do these comparisons produce, disrupt and/or reify in feminist theory, and how do such effects resonate within popular culture? Taking a relational web approach that focuses on unravelling the binary threads that link specific embodied practices within a wider representational community, this book highlights how we depend on and affect one another across cultural and geo-political contexts. This book is valuable reading for undergraduates, postgraduates, and researchers in Gender Studies, Postcolonial or Race Studies, Cultural and Media Studies, and other related disciplines. Carolyn Pedwell is Lecturer in Media and Cultural Studies at the University of Newcastle upon Tyne, UK. Her research interests include feminist and postcolonial theory; gender, cultural difference and ‘the body’; and the transnational politics of emotion and affect. Her work has been published in Feminist Theory, Feminist Review, and Body and Society.